Samsung’s previous dabble with an Android-powered camera, the Galaxy Camera, was largely a hit and miss effort. While many praised the addition of 3G and WiFi connectivity into a digital camera, the actual imaging prowess of the hybrid camera itself wasn’t up to par for a device of its size. The freshly-announced Galaxy S4 Zoom further reduces the Galaxy Camera footprint into a size slightly larger than the Galaxy S4 smartphone, with a smaller 16MP sensor with 10x optical zoom. It appears the Korean company is clearly pushing hard into Android-powered cameras. Samsung CEO JK Shin reportedly revealed to reporters that “Samsung will release (their) latest mirrorless camera that runs on Google’s Android software.” Interestingly, this came at around the same time that press images of a “Galaxy NX” mirrorless camera appeared online, showing off a Samsung mirrorless camera with three interchangeable lens and what appears to be a touch display with familiar TouchWiz icons. 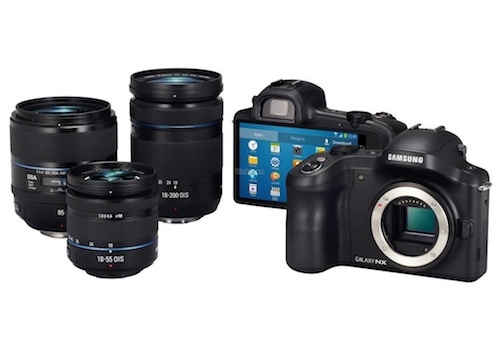 The Galaxy NX is rumoured to sport a 20.3MP APS-C sensor with proprietary NX mount lenses. Some of the interchangeable lenses also feature Optical Image Stabilisation. If the rumours are true, the Samsung Galaxy NX is set to make an appearance at this week’s Samsung Premiere event in London.